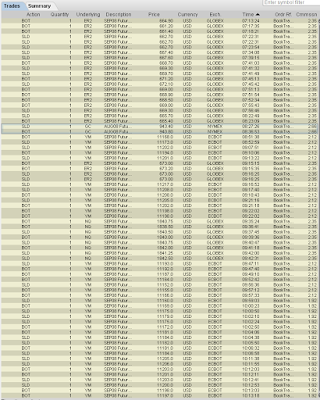 I had a really good trade on an ER2 long near the morning lows. I sold too soon because I was a little scared about the volatility and my trading size that I put on. I should have held at least 1 contract. I read on TokyoTraders blog that real estate and banks were strong in Japan, which I really didn't expect to hear, so I kept a sharp eye on the banks, FRE, and FNM. 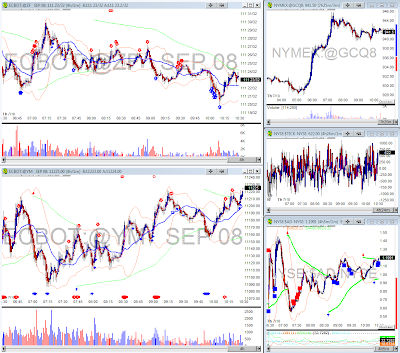 Overall, I got a good 2.5 pt scalp on Gold near the highs of the day and did a lot of scalping in YM. I traded 36 contracts today. This time last year I was trading 100-300 contracts a day and had big swings in my daily P/L. Times sure have changed. Today I did good because I was talking to myself and I watched the bond/stock relationship well. If I had a bad trade, I said, get out, get out, don't let it drop on you, 2 ticks drop, and I'm out. I said, don't be greedy, scale out, don't be greedy, I'm out. My first trade of the day I let drop pretty far. I should have used a 7 tick stop even though I was prepared to average in 2-3 contracts on my first trade of the day.